Serving Cole Harbour and surrounding areas since 1995. 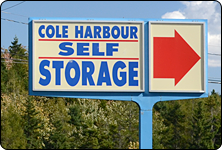 Safe and accessible storage conveniently located just 1.5 kms from Forest Hills Parkway and Cole Harbour Road. We are members of the community (locally owned and operated) and treat others as we would like to be treated – with respect, courtesy and fair practices. There is a range of storage types including heated units and unheated drive up units - we can accommodate most storage needs. The premises are clean and well lit and we have timely snow removal. Corridors have carts and hand trucks for use when loading or unloading. We offer convenient monthly billing to go along with competitive rates. There is a debit machine in the office and we can set up automatic payments with credit cards or pre authorized chequing. Boxes and packing supplies are available to purchase in the office which is on site and staffed during business hours. Please refer to our Frequently Asked Questions and Units for more information. If you wish to reserve a unit, please call or use our online Reservation Request Form.